For indigenous cultures, property is an alien concept. Yet the market-driven industries of the developed world do not hesitate to exploit indigenous raw materials, from melodies to plants, using intellectual property law to justify their behaviour. Existing intellectual property law, for the most part, allows industries to use indigenous knowledge and resources without asking for consent and without sharing the benefits of such exploitation with the indigenous people themselves. It should surprise nobody that indigenous people object. As a starting point toward mutual understanding and a common basis for communication between Western-style industries and indigenous communities, Indigenous Heritage and Intellectual Property is of immeasurable value. It offers not only an in-depth evaluation of the current legal situation under national, regional and international law including analyses of the Convention on Biological Diversity and other international instruments, as well as initiatives of the World Intellectual Property Organization (WIPO), the UN Food and Agriculture Organization (FAO), and other international bodies but also probes numerous further possibilities. 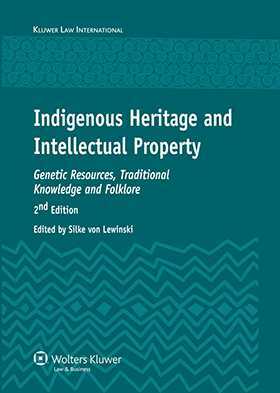 While no one concerned with indigenous culture or environmental issues can afford to ignore it, this book is also of special significance to practitioners and policymakers in intellectual property law in relation to indigenous heritage. This book, here in its second edition, presents the most recent state of knowledge in the field.